The ancient Charles bridge is truly an artistic piece of work. It is named after the Roman Emperor and Czech King Charles IV (Karel IV. ), who initiated its building. 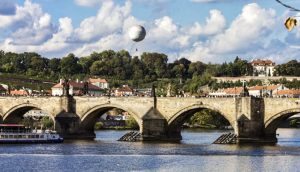 It was to replace the originally romanesque Judith Bridge, which was battered by the onrush of the swollen river Vltava. It was an imposing replacement. The Emperor personally placed the corner stone and the young outstanding architect Peter Parler made a monumental gothic building of it. He used the existing gateway on the bank of the Lesser Town(Malá Strana) in its original condition, including the lofty Bridgetower. And at the side of the Old Town he finished with the compact building of a second haughty Bridgetower. The two-storey building is richly embellished with architectural and heraldic decorations. A sculpture of the emperor himself looks down from the central level of the façade, next to his son Wenceslas and in the middle Saint Vitus under whose protection the bridge was given. The bridge, known for its typical bend on the bank of the Lesser Town, is 516 meters long and 9 and a half metres wide. At the beginning of the 15th century it was decorated with sculptures. It gained its present appearance however in the baroque period and became literally a gallery of sculptural art. Therefore it unites two different styles of expression: Gothic architecture and baroque sculpturing. However this union of separate styles is not disturbing. For the famous French sculptor Rodin it recalled the image of a centaur. It is said that in Prague “every stone talks” . This counts in many ways for the Charles Bridge.